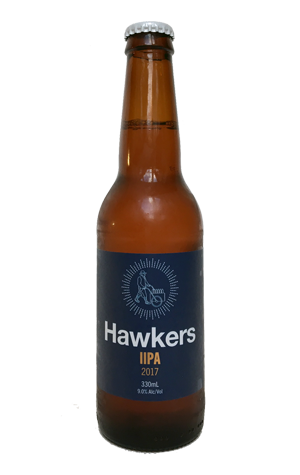 Aside from a five-way collaboration hosted for the Good Beer Week Masterclass in 2015, for the first year and more of operation, Hawkers Beer impressed with a consistently good core range of to style beers and rapid growth. More recently, however, the shackles have been loosened, allowing for a couple of imperial stouts to appear and the amassing of a seriously large number of barrels – not to mention the launch of second brand Rover. It means fans of the Reservoir brewery can look out for much more to come, such as a barrel-aged collaboration with Larry Sidor from Crux Fermentation Project. Larry, with whom we'll be running an interview when said beer appears, was at Hawkers at the time this imperial IPA was making its way through the brewhouse. A former brewmaster at Deschutes before setting up Crux in 2012, he knows his way around hoppy beers and declared himself impressed. Having tasted the finished product, it's not hard to see why. While it's big and jam-packed with hops, it's also a Hawkers beer, so comes suitably free of rough edges, pouring a gleaming copper and with an upfront fruity punch. And, while that potent hop kick and its texture remind you of its size (9 percent ABV), there's no boozy heat, instead the fruitiness is followed by deeper, herbal hop characters and a balancing, drying bitterness. tl;dr – It's a cracker.